Redding area lakes fishing report! Shasta Lake winter brown trout! Shasta Lake is fishing very well right now for both rainbow trout and German browns to 8 lbs. The fish are near the surface in the 50 degree water and its remaining consistent that they bite up high in the morning and drop to 25-35' feet by mid day. We are mostly trolling Trinidad Tackle Optimizer spoons at 3.8 mph which has revealed itself as a deadly technique for catching browns on Shasta Lake. Big rainbows will chase them too, and so its largely a spoon trophy hunters use to catch these bigger class of fish. www.optimizer.com offers many color combinations, but #3 or #4 spoons which include white have proven so far to be the hot baits on Shasta. Black, orange, and red is a safe bet as well. I'm catching browns all over the lake, but some of the areas such as the McCloud Arm are really good right now. If its limits of trout you're after, look to the upper reaches of the arms in Shasta for fast action trout in the 1-2 pound range. We've been averaging about 40 fish a day when we are just fishing for numbers. The smaller rainbows are biting 2" inch spoons and Arctic Fox Trolling Flies. Tip your flies with nightcrawler for the best results. White, rust, or black trolling flies are dynamite! I find that these trout will be in the top 15' of the water column and I have great success in the 2.5 mph trolling range. 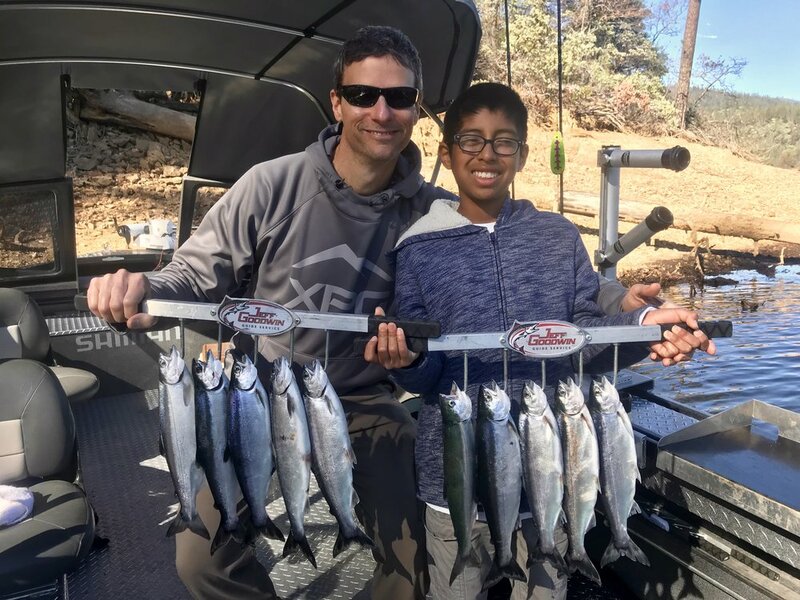 Whiskeytown Lake Kokanee limits for this father son team! Whiskeytown Lake is still producing good numbers of Kokanee salmon to 17" inches, but most are in the 12"-14" range right now. I'm finding them out over deeper water in 5'-25' depending on the sunlight. The Kokanee will drop down a bit when its sunny, especially when the lake surface glasses over. I mainly use Mack's Lure Kokanee product along with Brads Killer Baits when fishing Kokanee, but Arctic Fox Trolling Flies are very productive as well. the three most important components to Kokanee fishing success is, trolling speed (1.1-1.5 mph), proper depth, lure color and scent. Key in on depth and color when you get bites. Adjust your other lines to the same depth if possible and stick with a hot color until it stops producing. If your bite shuts off, mix up your presentations again but maintain speed and depth. I know there are some out there that will disagree, but I won't go Kokanee fishing without Pautzke Bait Co. Fire Corn. I usually add tuna oil, krill powder, or garlic scent to the jar of Pautzkes Fire Corn. Its durable, and the bite stimulants Pautzke puts in their corn doesn't hurt either. I use the natural color a lot but the other colors such as pink or chartreuse work as well. Trinity Lake has been productive for planter size rainbows near the dam on recent trips, but its a late starter because of the fishing down on Shasta and Whiskeytown is so good early on in the year. With an increased limit of salmon on Trinity Lake (10) per person, Trinity will surely gain more popularity this season with anglers who are on a meat run! I'll also be fishing Lewiston Lake this summer, but with very low flows right now, fishing will be slow until the spring releases begin. The same goes for Keswick Reservoir, which like Lewiston, fishes best when there is current on those bodies of water. Newer PostRise of the Trinidad Tackle Optimizer spoon! Older PostShasta Lake trout fishing is very good!